At last! An AFFORDABLE and WASHABLE men's DISCO SHIRT. 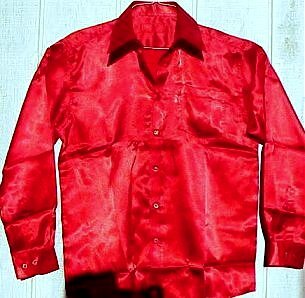 This one is TRUE RED in color and is shiny as it looks like satin from a distance, but it is actually very lightweight and washable unlike heavy vintage satin. This fantastic reproduction disco shirt is 100 % polyester, but again is very lightweight and breathable. It has the cut of a man's dress shirt, but of course is OUTRAGEOUSLY BRIGHT and SHINY, hopefully not your every day wear, perfect for a Pimp and Ho or a 1970's theme party. These shirts run a little large, but are not greatly oversized. Some mediums fit like size 38, 40 or even a 42. You might want to state your chest size when ordering under comments. I ship almost daily and am willing to Fed Ex. Flashy gold solidly made $ sign disco chains are available for $6.50 a piece. Men's tinted 70s style (some original never worn) aviator sunglasses available for $6.50 as well.